I mentioned in my last post about my skepticism about fennel. I have a pretty fierce dislike of the anise flavor, which always makes me think of the bags of black licorice you can buy at the drugstore for 99 cents. <shiver>. That being said, I kept seeing recipes with fennel and people raving about how delicious it is. By people, I mean TV personalities. This, of course, means that I have no idea what their general stance on drugstore bags of black licorice is. Hence why it took me so long to try fennel. However, if it’s in the CSA bag, I’ve made a solemn promise to try it. The farmer’s market suggested a fennel and citrus salad and I thought that sounded very refreshing and light. I didn’t have half the ingredients that the recipe they gave called for (that’s kind of my M.O. – just ask my mom who throws her hands up in frustration nearly every time she comes to visit and tries to cook something) so, as usual, I made do with what I had. This meant simplifying the recipe, which I’m all about. The result was a very quick and tasty salad that had lots of flavor and crunch thanks to the fennel. I added some rotisserie chicken to make this into a more substantial lunch. I’m not sure I’m a fennel convert, but I’m not scared of it anymore. I’ve heard that it’s good roasted with olive oil and salt, but then, what isn’t? I purposefully selected a very small fennel bulb from the CSA boxes so I don’t have any extra to work with. However, I may be so daring as to pick it up at the store one of these days. Well, that’s actually not very likely. But if it does cross my path again in a CSA bag, I’ll give roasting it a try. 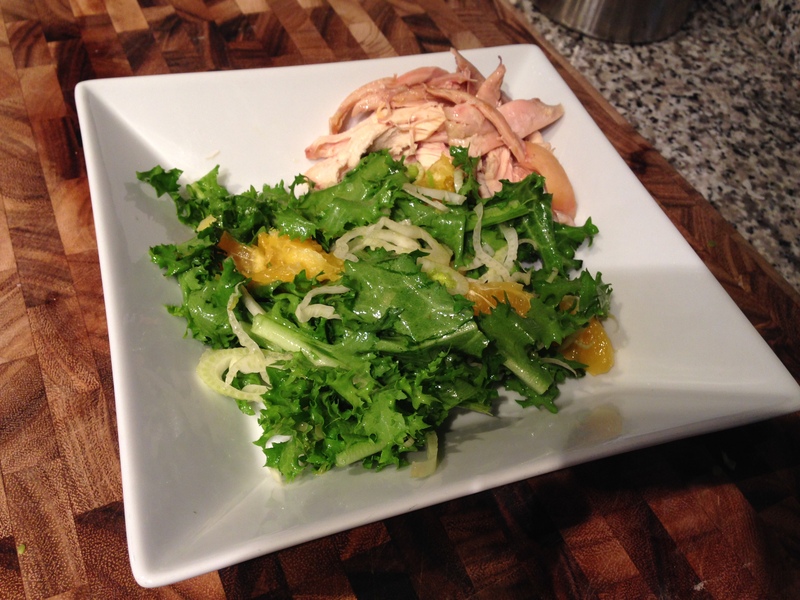 Or, if I have come oranges lying around, will make this salad again. 1. Peel the orange over a bowl, collecting the juices, and separate the slices. Add slices to bowl with juice. 2. 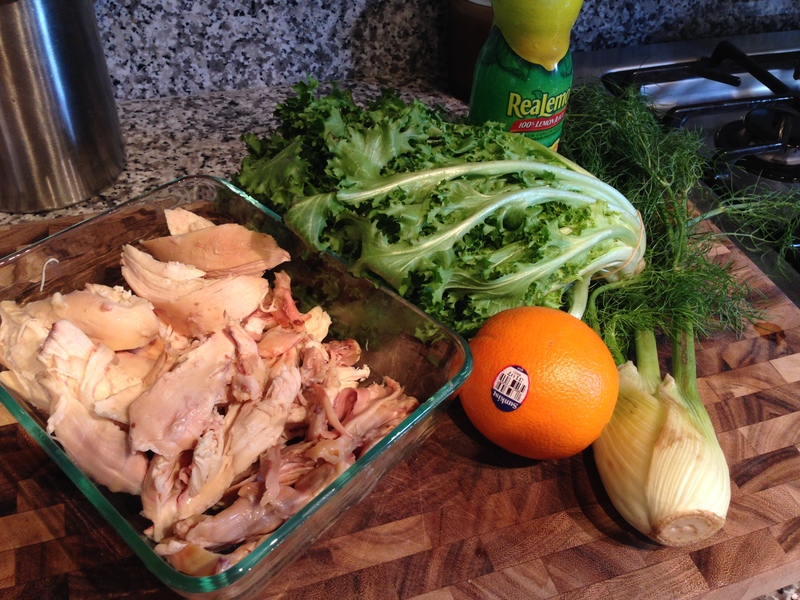 Thinly slice fennel bulb and add to bowl with oranges and orange juice. 3. Add chicory endive, lemon juice, olive oil, and salt. Toss to combine. 4. Serve as side salad or add in meat or beans as desired.